Mission San Juan Bautista. Courtesy of Santa Barbara Mission Archive-Library. 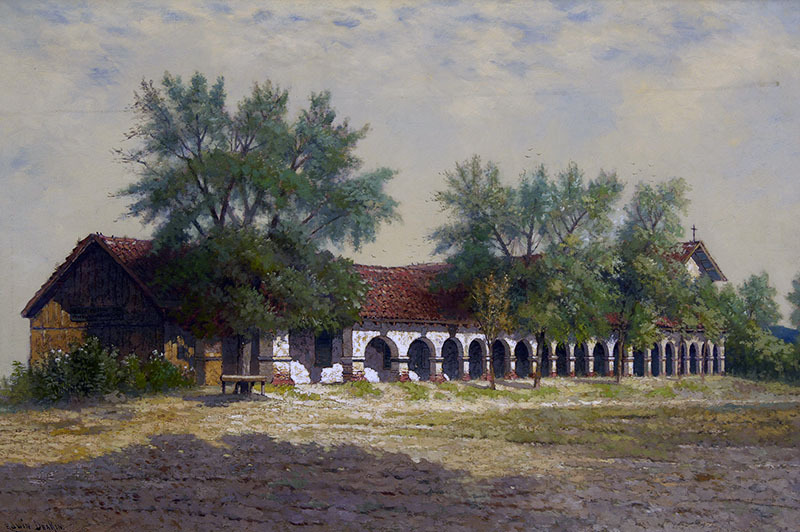 Fifteenth in the chain, Mission San Juan Bautista was founded by Father Lasuén on June 24th, 1797; the feast day of John The Baptist, Patron Saint of the mission. Just as the mission has been preserved, so too has the charming city in which it stands. Modeled after a Spanish town, some thirty historic buildings occupy the area surrounding the mission, offering visitors a look at what life was like during the mission era. The mission sits in Plaza San Juan Bautista. The Plaza Hotel, dating back to 1814, served as the mission barracks. The Zenneta House, or the Plaza Hall, dates back to 1868. The Plaza Stable was built in 1874 to serve as a stop over for travelers. Mission San Juan Bautista is in the unfortunate position of being on the San Andreas Fault. The powerful earthquake of 1906 ruined the outer church walls and other buildings. Near the mission stands an unspoiled section of the famous El Camino Real, or Kings Highway. Located just beyond the cemetery wall is a marker showing the direction the road took, connecting the twenty one missions, six hundred and fifty miles in total, from San Diego to San Rafael. San Juan Bautista boasts the only three-aisle church among all of the missions. The archways, which separate the center from the side aisles, were destroyed in the 1812 earthquake. The fathers then filled in the two side aisles. However, church restoration in 1975 allowed the side aisles to be re-opened, returning the church to its original three-aisle design. Much of the church remains as it had in 1812, with the main altar reredos and bultos largely un-restored. Pay close attention to the church floor tiles and you will notice animal prints that were made while the tiles were left outside to dry in the sun. The church also plays host to the largest and most complete collection of apostolate paintings in the mission chain. From I-5: Exit CA-152 West at Los Banos. Take the Hollister exit to CA-156 West to town of San Juan Bautista. Follow signs to the mission. From US-101: Exit-156 East to town of San Juan Bautista and follow signs to the mission. 9:30a - 4:30p daily; closed major holidays. Please call 831-623-4528 for further information. Parish Reception Hall, call 831-623-4791 for information. Weddings and baptisms, call 831-623-2127 for information.